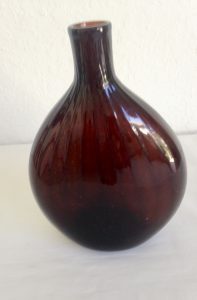 Scarce deep amber “Grandmother” Flask. 6 1/2″ tall. Excellent color. Zanesville, Ohio, c. 1830-35. Perfect condition. 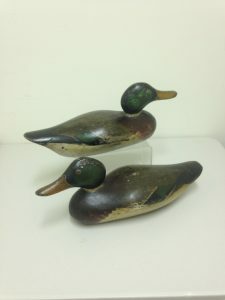 2 Mallard Drake Ducks with their original paint, Attributed to J.N.Dodge of Detroit, Michigan, operating from 1883-1894. Some wear from use in the field. One of the early production makers before Mason. 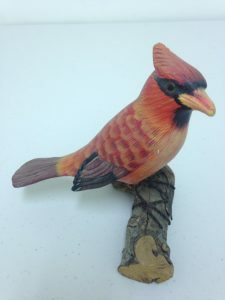 A nice hand carved wooden statue of a colorful cardinal. Nicely hand carved and painted. 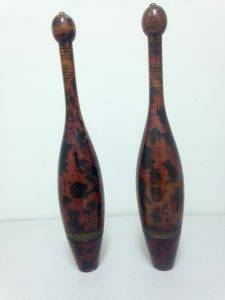 Made of wood with metal legs and a wooden base. Some paint wear from handling. 5″ high and about 4″ wide. Probably 30-35 years old. Nicely carved and painted bird whistle. Pressing down bird’s tail changed sound of whistle. Overall size – overall 6″ long, bird is 3 1/4″ long. Excellent original condition. Thought to be from Overammergau, Germany, c. 1960’s. From a PA collection. 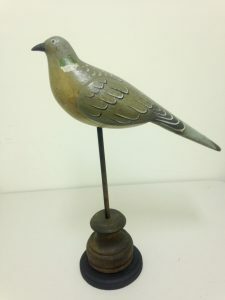 Nicely carved and painted dove or pidgeon on a turned wood display base. Excellent condition with realistic colors. Bird is about 14″ long, height about 17″. 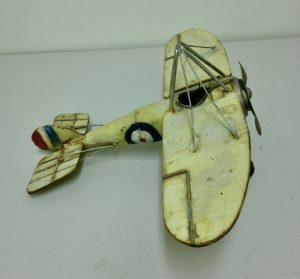 Probably 4th Quarter 20th C.
Interesting sheet metal, wire, wood and tube construction of a British WWI era Fighter model with mounted machine gun. Pretty good condition for an old toy plane. Nice faded paint. Probably 1st half of 20th C? 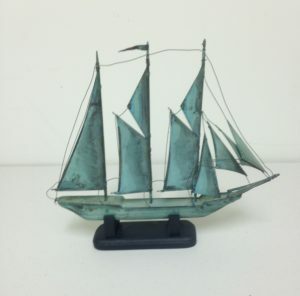 Nice small handmade copper model of a 3 masted schooner. Full set of sails and rigging. Very good condition. Great verdigris surface color, probably an artificial process. Size – 11″ wide by 9 1/2″ high including the base. Displayed on a custom base. Probably mid to 3rd quarter 20th C. Great for a weekend sailor’s desk. 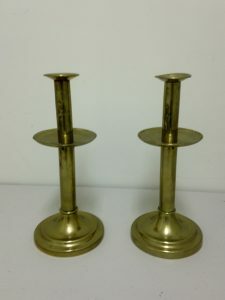 Nice tall pair of early 19th C. Brass Candlesticks with unusual medial drip pans. Retain their original push ups. Excellent original condition.